This splendid Catholic church of 2012 on the Shelfanger road was the replacement for the 1952 church of Holy Trinity down in the town. Holy Trinity itself was a fairly utilitarian conversion of a former bakery, and had been enlarged for Diss's growing Catholic population as recently as the turn of the 21st Century, but it was clear something new was needed. Diss had only become a Catholic parish in 1968, and the continuity of the church during the penal years was maintained by local big houses rather than in the town. Henry Morse was a local lad. He was born at Brome just over the Suffolk border in 1595 towards the end of the Elizabethan period. At the age of 19 after the death of his father he went to France, and was received into the Catholic Church at the English seminary in Douai where his brother was studying for the priesthood. Eventually ordained himself, he served the faithful in Newcastle and London. After a number of narrow scrapes he was eventually arrested and charged with treason, and of being the cause of treason in others. Taking the vows of a Jesuit while imprisoned, he was condemned to death by hanging, drawing and quartering, the standard punishment for treason, in 1645. The anti-Catholic fury of the Elizabethan period had dissipated somewhat, and at his martyrdom at Newgate Morse was mercifully allowed to die on the scaffold. When his bowels were wound out of him and his body cut into quarters, the crowd surged forward to dip their handkerchiefs in his blood. 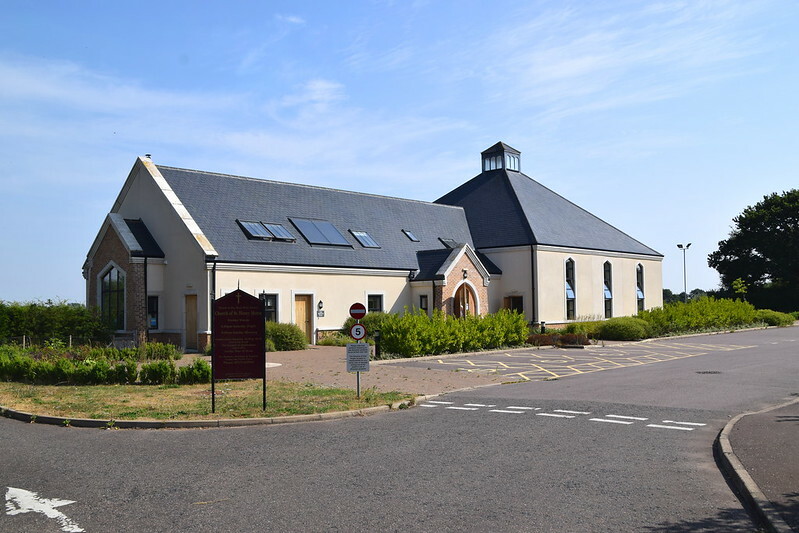 The new church cost almost exactly a million pounds, funded by the sale of the land on which the former church stood. The style could be termed agricultural vernacular, and the architects were Hollins of Framlingham. 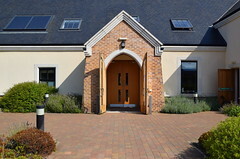 The structure successfully combines a square worship space at the east which can be extended into the hall to the west with a flat for the resident priest, a nice medieval touch. The overwhelming impression inside is of a church full of gathered light. 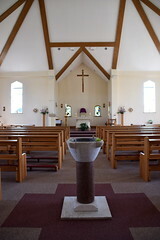 The parish brought their font with them, but the restored details of stained glass windows around the sanctuary were from Stowmarket Catholic church, in which parish this originally was. 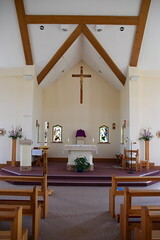 The rood came from the Catholic chapel at RAF Marham, and the altar from the Carmelite convent at Langham. 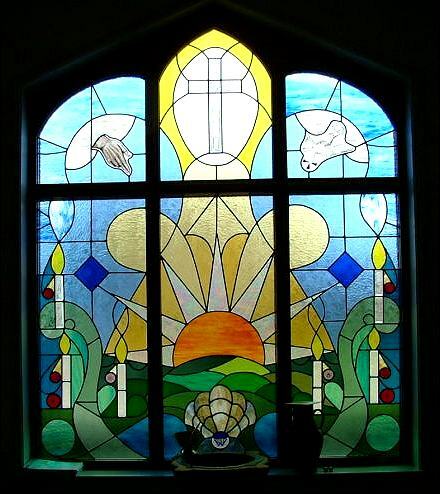 The modern abstract glass installed at Holy Trinity barely a dozen years earlier was also brought here, and forms a west window into the parish hall. All in all, a church done well, seemly and fitting for Catholic worship and suitable for the life of the parish in the 21st Century. It appears to be open every day.